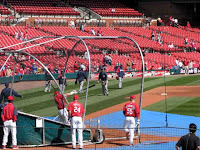 Chris Duncan has hit better on the road than at home, but Tuesday night at Busch Stadium, he launched a bomb into the left center field bleachers in an at-bat that followed a blast by Albert Pujols that narrowly missed thumping into Bic Mac Land. The St. Louis Cardinals ran away with an 11-2 victory of American League rivals, the Detroit Tigers, helping starter Adam Wainwright continue to work toward maintaining a solid track of performance. The offensive support for many of the excellent starting pitching performances showed up for the Cards, but the win may have been tempered a bit by what appeared to be a foot injury of some type to Brendan Ryan, the result of a quirky finish to a swing at the plate. The most important part, in my estimation, of the swings-of-change, so to speak, was that both Duncan and Rick Ankiel actually appeared to be "thinking middle," and taking the ball to the opposite field when appropriate. Both dead pull hitters if you track their respective hits on a spray chart, would be well served by "staying back" a bit more on their swings, allowing themselves to drive the ball into the opposite field when the pitch count and location dictate such a batted ball. This is not hindsight, however. I've been harping on this for some time now, and whether the hitting of Tuesday night's game by Ankiel and Duncan was by design or accidental, it ought to open their eyes to a capability at the plate they don't seem to realize they possess. To further analyze Duncan, his usual swings almost make it appear he is a hitter who doesn't believe he can hit more kinds of pitches better, when actually, he is a far better hitter than he make realize. To further analyze Ankiel, he appears to be making too many guesses at the plate. This observation, however, is totally a 20-20 hindsight thing. This doesn't mean something cannot be learned from it. It still appears Ankiel is "yanking" the bat too much with arm muscle, a tense condition which jerks the head and therefore, line of sight. He definitely has enough strength to get more relaxed, smoother, and with bat speed. A "Lauist" approach might serve him better, but this is such a matter of personal feel and comfortability, it could just as easily foul him up worse. In any event, I would stick with smoother, staying back and going for bat speed. Hitting some plastic golf balls with a broomstick handle is nice Old School way of working toward bat speed and while demanding keeping the had still; you can accomplish neither by muscling. Please, add your thoughts. It's fun pretending to be Hal McRae.